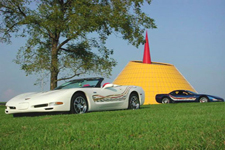 “The Milestone Trio” celebrates the first Milestone Edition/National Corvette Museum Corvette design. 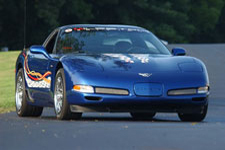 I personally designed the graphics and selected the performance and appearance options for this limited edition Corvette. 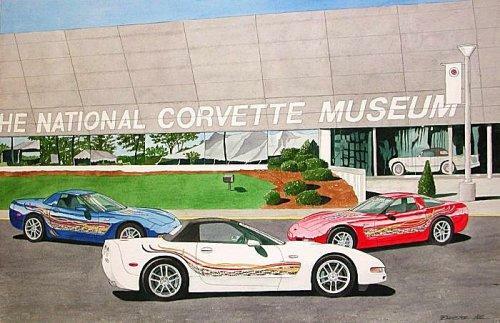 I’m in discussions with the National Corvette Museum staff about another Milestone Edition. Sequentially numbered and engraved dash plaque, vinyl body graphics. 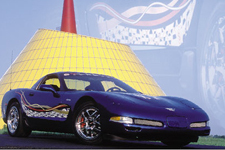 The graphics package includes a checkered flag with 50 gold rings, three ribbons running through the flag, and the NCM logo. Lloyd embroidered floor mats bearing the logos of NCM and Milestone Editions. A sequentially numbered and engraved dash plaque. 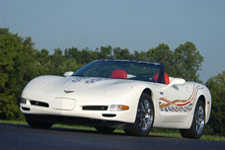 Windshield banner with logos of NCM and Milestone Editions. Color keyed engine fuel rail covers personally signed by Dana Forrester and a certificate of authenticity.